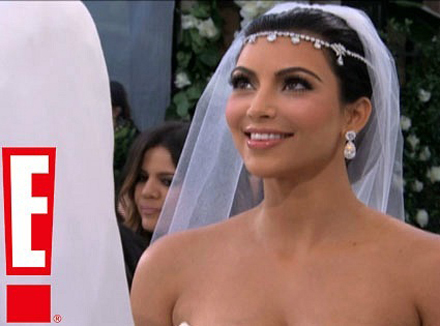 On August 20, 2011 the wedding of American socialite, Kim Kardashian, and New Jersey Nets NBA basketball player, Kris Humphries, was held. The whole wedding ceremony was costly enough; however the couple managed to make money on it as well. People Magazine paid $1,5 million for taking exclusive wedding photos which will appear in the next edition. The wedding video will be broadcast in October on E! However the first “teaser video” is available. Today is the day! I can’t believe it’s finally here! Thank you so much to everyone who made this day happen!!!!! The stunning bride wore a Vera Wang dress. Besides, Kim Kardashian wedding guests had also been given strict dress code – they were asked to dress only black or white. Famous friends, family members, in total 440 guests, attended the lavish ceremony. The list of celebrities consisted of Avril Lavigne, Demi Lovato, Eva Longoria, Kelly Osbourne, Ryan Seacrest, Lindsay Lohan, Mel B.
I so wish my dad could be here today to walk me down the aisle. But I know in a way he is here, and I feel his loving presence all around me. I love and miss you, dad. When you know you know.We’re having so much fun we just get along so well, he just lets me be me. And we have such a good relationship. It’s such a normal, healthy, trusting, easy relationship.